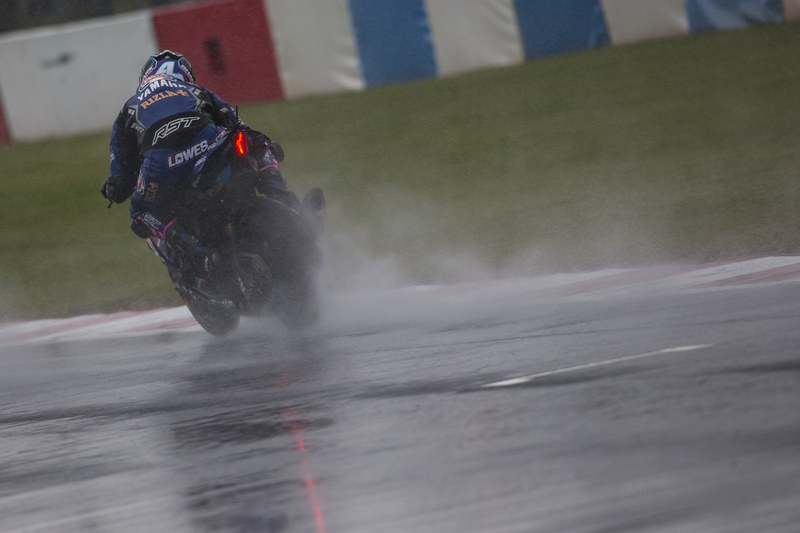 It was a promising start for the Pata Yamaha Official WorldSBK Team’s three-pronged attack at a wet and windy Donington Park on Friday for Round 6 of the 2018 Motul FIM Superbike World Championship. Local hero Alex Lowes showed good pace in the wet and the dry to end the opening day in fourth overall with a 1:28.567. Joining him directly in Saturday’s SP2 is his teammate Michael van der Mark, who improved throughout the day despite the mixed weather to finish in sixth on the combined timesheets after setting a 1:28.768. Official Test Rider Niccolò Canepa is a wildcard at Donington and he showed his class by ending Friday in 14th with a 1:29.616 as he spent the day readapting to riding the Pata Yamaha R1. Tricky conditions greeted the Pata Yamaha team on Friday in the UK, with torrential rain and strong winds in the morning meaning FP1 and FP2 were both fully wet sessions. Luckily, the rain disappeared in the afternoon – although track temperatures did not rise above 17°C – and with the strong winds, the track started to dry for FP3 allowing the riders to head out on slick tyres. Donington Park is the team’s home round and this weekend sees all three riders sporting a special one-off blue Rizla livery on their Pata Yamaha R1s. You can’t get much more of a local hero than Lowes, who lives 3 miles away from the Donington Park track and simply loves riding in front of the British fans. The 27-year-old got off to a solid start in the extremely treacherous conditions that greeted the riders for FP1, finishing in eighth with a 1:47.272. As the conditions started to improve, so did Lowes’ lap times. In FP2, despite still being on full wet tyres, the 2013 British Superbike Champion improved to a rapid 1:39.296 to end the session in third place. The rain stayed away for FP3 and with the track starting to dry, he went out on slicks and set a 1:28.567 – just 0.567s off the fastest rider – to end Friday in fourth overall. After a strong start to his home round, the 2017 podium finisher at Donington Park is now aiming to improve even more on Saturday in qualifying to allow him to get the best result possible in Race 1, whatever the weather brings. Van der Mark was still recovering from a virus as the day started and with the torrential rain in FP1, the 25-year-old Dutch rider decided not to take any risks and sit out the session to allow him to recover. When FP2 rolled around, his condition had improved and he gradually built his pace up to a 1:40.872 to end the session in 15th place. Heading out on slicks for FP3, the 2014 WorldSSP Champion got to work and improved dramatically in the dryer conditions – despite a small crash at Turn 3 – to set a 1:28.768 and finish the day in sixth overall, 0.765s off the top. Van der Mark is confident that he can make another step on Saturday with his pace and consistency to allow him to battle for the podium during Saturday’s Race 1. Wildcard Canepa showed exactly why the team rewarded all of his hard work in testing with a run out this weekend by making a solid start on Friday as he adjusted to the Pata Yamaha R1 and Pirelli tyres, fresh from finishing second at the 8 Hours of Slovakia Ring last weekend with the GMT94 Yamaha Official EWC Team. The recently turned 30-year-old Italian got off to a flyer in FP1, finishing in sixth place in the tricky conditions as he put all of his endurance experience to use. In FP2, the reigning Endurance World Champion finished in 20th overall with a 1:41.936 but showed superb improvement in the drier conditions of FP3 to end the day in 14th on the combined timesheets after setting a 129.616. Despite not having the dry track time he would have liked to adapt to the bike, Canepa is looking to improve again on Saturday morning and make it through to SP2 as one of the two fastest riders in SP1. Sadly, the forecast for Saturday is also looking mixed, with Pata Yamaha Official WorldSBK Team returning to action at 9:00 am local time (GMT+1) for FP4, with qualifying starting at 10:45 am and the 23-lap Race 1 due to kick off at 1:15 pm. Check out the combined Friday free practice times.